Douglas Adams, a famous British Comic Writer starts today’s post with his dry wit. “This must be Thursday. I never could get the hang of Thursdays.” If you are still trying to get the cobwebs out of your head and make it to Friday, you just may relate to this saying. But let’s jump back on topic for the garden book lover. While browsing the shelves of the local library, I discovered a gem of a book published in the UK in 2000, loaded with inspiring imagery and great homespun tips for the garden. 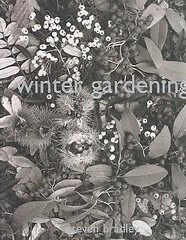 Although it is called, ‘Winter Gardening’ by Steven Bradley, it is not your typical winter gardening paperback. This book is ‘chock a block’ with tips and illustrations for the four seasons. Although UK’s milder climate is similar to our Pacific Northwest, ‘Winter Gardening’ is applicable to the colder temps, too. While the fall color is still brilliant in this neck of the woods and there is much still blooming in the garden, the winter gardener should stay engaged throughout the cooler weather. There is never a dull moment in the gardener’s life. We are always looking for new ideas, techniques and concepts but we should also take heed and practice the traditional methods, which this book illustrates brilliantly.